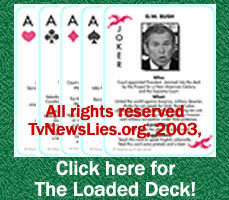 While the original version of this site was posted on Jesse's personal home page in late March, the TvNewsLies.org domain was officially launched 4/11, as in 411, as in INFORMATION! Now, there's a significant coincidence, wouldn’t you say? ** Get Your Free Flyers to help get the message out by clicking here! Thank you all for visiting TvNewsLies.org. Unless we get some help we may not be able to continue to maintain the site. We are getting a lot of traffic so we had to upgrade our hosting service level twice so far! We actually had the site shut down due to heavy volume! This means people appreciate what we have to offer. Please help us. You can donate directly; for the price of a few newspapers or of a 1/2 beer at a ball game you can help us to continue this vital mission! Please help! For those of you who shop online please view our mall. If the stores that you normally shop at are listed please use our website when you enter the store to do your shopping. You get special discounts because of our affiliations and we get credit from the stores! Please help...we may not be able to stick around too long without your help! Mailing list - FREE to join! Support Us - Visit the Shop! Shop at your favorite stores and support this site. Advertise here - See our extremely reasonable rates! Donate! - Or we we’ll be gone soon! Contact - List of contact e-mail address for this site. Updates/Announcements - History of daily updates and special announcements. Editorials - You can submit your own too. Reader’s Mail - Your feedback about this site and about the issues. Expecting Jesse’s World? - This started as my personal site. TvNewsLies Hall of fame - People to whom we would like to pay our respect. TVNL would like some readers to share some of the positive actions of the Bush administration with us. We will start a section dedicated to the positive actions that go unreported, but we have not heard of any. Please contact us if you have some leads. Reader’s Art - Creative political statements by our readers. Special Thanks to our contributors - Those who do not want to remain anonymous. On July 24th, 2003, the editor of TvNewslies.org was interviewed on the Meria Heller Show. The Meria Heller Show has been the #1 Internet radio show for 3 straight years! Meria covers the issues that mainstream media doesn’t have the guts to even mention! Listen to the interview here! Our web site works best when viewed with Firefox. It is a free browser. It is extremely secure and it is loaded with features. It is by far the fastest browser we have tested. Site Seach - We replaced our old search engine with a Google search tool. The old search tool did not work very well.